Bycatch remains one of the main threats to these species at the global scale, including in the Western Indian Ocean (WIO). However, information on the magnitude of bycatch is still lacking in artisanal, commercial and semi-industrial fisheries, while mitigation measures are nonexistent for most of them. The aims of this project are to assess bycatch and develop economically viable methods for mitigation of non-target mega-fauna species bycatch (retained or discarded) in artisanal/small-scale commercial gillnets (drift-and bottom sets), longlines, and semi-industrial prawn trawl fisheries in the WIO. The project will be implemented across the WIO with case studies in Kenya, Madagascar, Mozambique, Tanzania and Zanzibar. Central to developing evidenced based recommendations to improve management is understanding how and why decisions are made by fishers in relation to their fishing practices and compliance with management rules. This in turn is influenced by fishers’ perceptions of the health of a resource, e.g. indicated by catch size of targeted species, and their attitudes to management. Thus knowledge of drivers (e.g., environmental, economic and social) underpinning decision-making (governance) can be useful in ensuring that resultant policy recommendations reflects behavioral drivers more likely to motivate compliance for management measures associated with sustainable fisheries management practice. The project will bring together expert biologists, social scientists, interdisciplinary researchers and stakeholders, including fisheries managers, fishers, and government and non-government representatives. The team will adopt an interdisciplinary approach drawing on methods from the natural and social sciences and will collect both quantitative and qualitative data to assess the extent of bycatch in WIO fisheries and to develop strategies for mitigating bycatch while accounting for social and economic constraints and opportunities within a multi-level governance framework. In recognizing few studies in the WIO have examined the relationship between efficient governance and fisheries management efficacy, this project will extend earlier socioeconomic research undertaken by the collaborators in the WIO and apply state-of-the-art policy analysis methods to produce advice on options for addressing strengths and weaknesses in existing multi-level governance systems. The project will initially carry out its work through the creation of extensive network of fishers and observers to record bycatch in selected case study fisheries within each country (e.g. Mombasa-Kenya, Dar es Salaam-Tanzania, Stone Town - Zanzibar, Sofala Bank-Mozambique, Mahajunga-Madagascar and selected fisheries village landing sites in Kenya, Tanzania and Zanzibar). Effort will be assessed through these networks alongside triangulation of data including use of government fisheries statistics supplied by the project partners. An spatial database will be created detailing fisheries effort, gear type, species presence (in bycatch), levels of bycatch by gear type and areas of highest risk for species across fishing grounds in the WIO. This will identify of areas of critical need for management and where future research is needed. The project will then assess the level and potential impact of bycatch on social, economic and environmental drivers of fishers’ fishing behavior within a governance context before implementing a series of mitigation studies using future scenario analysis in order to test the success of different mitigation technologies, both existing and re-designed, and their feasibility in these fisheries, also accounting for their governance needs alongside management effectiveness. Proof of concept is provided through previous work on gillnet bycatch mitigation and use of fisher networks by the co-PI Dr Amir, as well as by the success of trials with prawn trawl bycatch mitigation devices in the region. 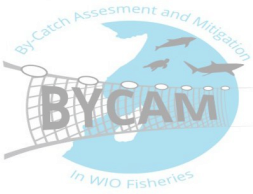 It is expected that the project will assess the scale and impacts of bycatch in fisheries across the WIO, and will introduce and test mitigation technologies and champion their use across the large-scale with associated governance recommendations and policy reform needs identified. Through this in the longer term the main impact will be reduced bycatch of long-lived marine megafauna and processes developed to support a move towards a more sustainable future for them and the ecosystems over which some of these keystone species exert top-down control.